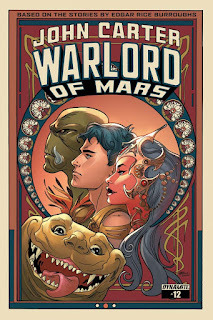 Jcomreader-News and reviews from Barsoom, Mongo and other planets! Still catching up so here's my take on the third issue of Star Wars: Shattered Empire. This issue has our heroes off on two missions. The first finds Sergeant Kes Dameron helping lead an assault on an Imperial Security site with Han Solo and Chewbacca that leads to the discovery of the Emperor's last order, Operation Cinder. Meanwhile Kes's wife Shara Bey and Princess Leia find themselves trapped on Naboo as the Empire launches the order. It's up to them, along with Queen Sosha, to fight off the Imperial ships before the planet itself is destroyed. 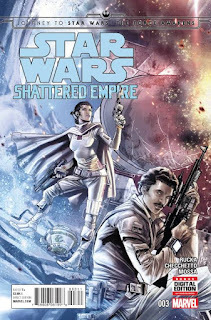 Like the first two issues, Greg Rucka and company are knocking these out of the park, presenting a story that is pure Star Wars. The team is presenting a good balancing act, setting up things for The Force Awakens while harkening back to the original trilogy and even beyond. There is enough action and moments that stick out. Among them: the opening battle; Chewie knocking skulls; Leia's reaction to the Naboo hangar and the discovery of her burgeoning Force powers; the air battle and much more that I don't want to spoil it. Helping is the tremendous artwork by Marco Checchetto and Angel Unzueta that catches the reader's eye and manages to accommodate the story being told. The battles look great, the characters are vivid and real and the color and light is handled brilliantly. I know that sounds like gushing but with work this good you have to. I'll get a review of this week's final issue up soon. For now go out and get this series if you haven't. Next time another Marvel space comic review. Until then folks have fun. 'The Force Awakens' The Final Trailer is Here!